Known as America’s team because of their success in the 1990s and popularity, the Dallas Cowboys opened a new chapter in their legendary history with the opening of AT&T Stadium in 2009. For more than 30 years, the Cowboys played at Texas Stadium, one of the most recognizable stadiums in football. However, just like every other team in the NFL, the Cowboys wanted a new football stadium to increase revenue. As far back as 1994, Cowboys owner, Jerry Jones, began looking into the possibility of a new or expanded Texas Stadium. Initially Jones wanted to expand Texas Stadium, adding 40,000 seats and a retractable roof. Over the next several years, Jones not only kept alive discussions of renovating Texas Stadium, but began looking at sites to construct a new stadium. Throughout the next decade, the Cowboys moved away from the idea of renovating Texas Stadium and focused on building a new facility. It took nearly a decade for the team to find a suitable site for construction, settling on a location near Globe Life Park, home of the Texas Rangers (MLB). In order to finance construction of the $1.15 billion stadium, Arlington voters approved a $325 million bond in November 2004 that raises the city’s sales tax by a half-cent, hotel occupancy tax by 2 percent and car rental tax by 5 percent. The NFL contributed $150 million towards the stadium with the Cowboys paying the remaining amount. 14 players inducted into the NFL Hall of Fame including Emmitt Smith, Michael Irvin and Tom Landry. Super Bowl XXVII (1992) MVP Troy Aikman. Team officials traveled the country, visiting some of the newest NFL stadiums in order to develop and design the greatest stadium in the league. 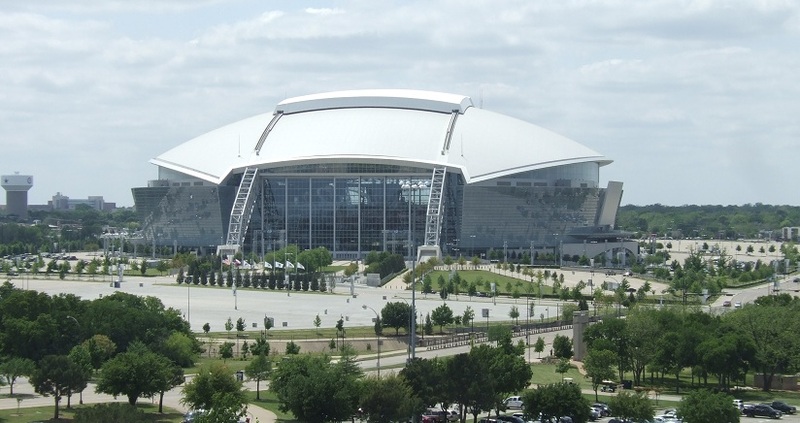 Designed by HKS Architects, Inc., AT&T Stadium is one of the most recognizable stadiums in all of sports. The exterior features a futuristic design that consists of a canted 800 foot glass wall. A pair of massive, 292 foot arches span the length of the stadium, supporting the facility and the retractable roof. At each endzone are glass retractable doors, 180 foot wide by 120 foot high. They are the largest in the world, and open or close in 18 minutes. Atop AT&T Stadium is the retractable roof, that when open emulates the distinctive Texas Stadium opening/hole. As fans enter AT&T Stadium they receive panoramic views of the field as it is 50 feet below street level. The stadium has a main seating capacity of 80,000 but is expandable to seat nearly 100,000 fans for large events such as the Super Bowl. The stadium does not feature traditional stadium seats that are bolted individually into the concrete grandstands. Instead the seats are fastened onto long, aluminum rails bolted into the concrete. The seats take up 24 inches of space with small gaps between the chairs. 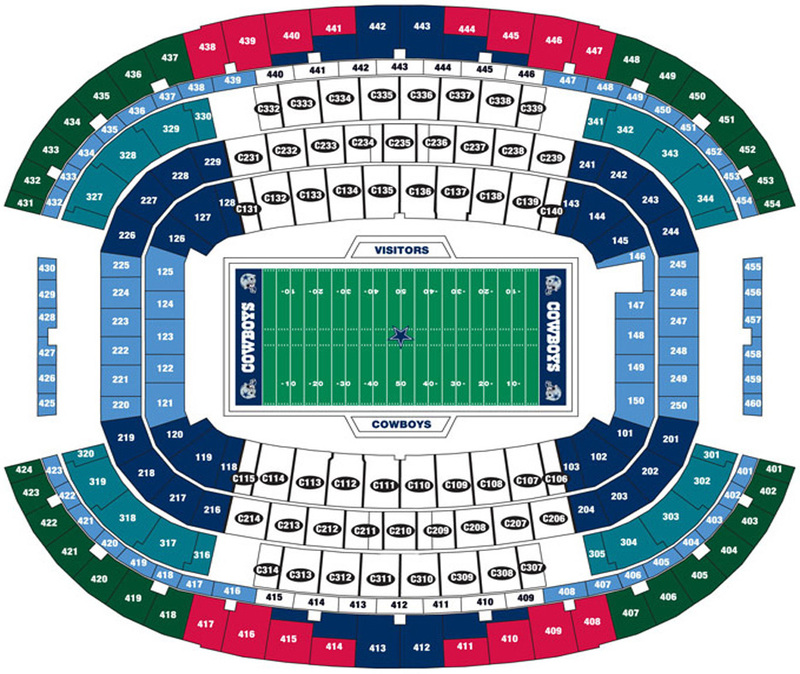 The Cowboys can squeeze the seats closer together, adding one or two chairs per row to increase the seating capacity to nearly 100,000. On five levels there are 200 suites that includes the Hall of Fame level that is just 21 rows from the playing field. There are 15,000 club seats surrounding the field offering additional features that are not be found elsewhere throughout stadium. Fans with seats anywhere in the stadium are able to see the massive HD vidoeboard that is suspended 90 feet above the center of the field. This four screen HD videoboard is 160 feet long by 71 feet high and runs from one 25 yard line to the other. It is one of the largest HD videoboards in the world. Many amenities can be found at AT&T Stadium including the Dallas Cowboys Hall of Fame and Pro Shop that allow fans to learn the history of their favorite team and buy merchandise. The first event was a country concert featuring George Strait on June 9, 2009. 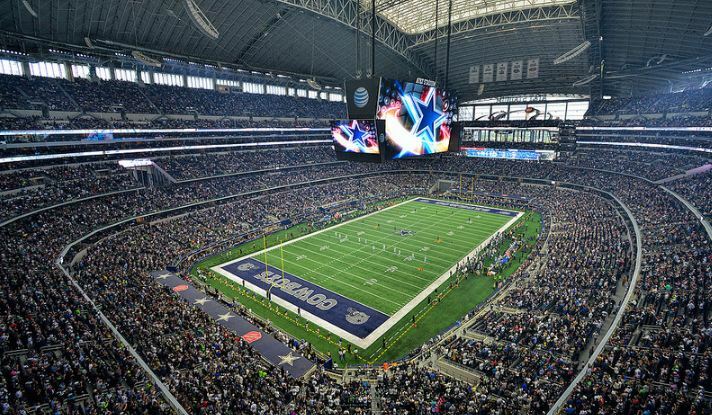 The Dallas Cowboys played their first game at the stadium on September 20, 2009 against the New York Giants. Originally known as Cowboys Stadium, the facility was renamed AT&T Stadium in July 2013 after AT&T Communications purchased the naming rights. In addition to being the home of the Cowboys, the stadium is the site of many high profile sporting events and concerts. They have already included the 2009 Big XII Football Championship, the annual Cotton Bowl, 2010 NBA All-Star Game, Super Bowl XLV in 2011 and the inaugural 2015 College Football National Championship Game.